– The events depicted must take place post-Vietnam. – The film can be about the actual war, the consequences of the war, or use a specific war as a backdrop. – Smaller military engagements and fictional battles can also be included. If you haven’t seen the following films, I’d highly recommend them to fans of war movies. Some may be difficult to find, but you can always remedy that by joining an online movie rental site like Netflix. 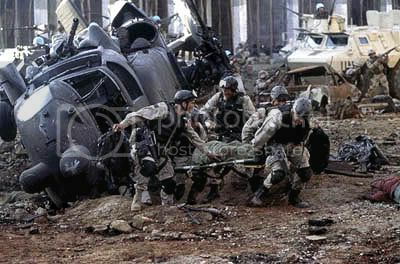 Black Hawk Down – Based on a book about the Battle of Mogadishu, Black Hawk Down tells about a combined mission between Army Rangers, Delta Force soldiers and the Special Operations Aviation Regiment to capture a Somali warlord. Things go haywire when two Black Hawk helicopters are shot down, and the planned one-hour mission stretches into 15 hours with over 1000 casualties. Tons of gunplay and an all-star cast which includes Josh Hartnett, Ewan McGregor, Tom Sizemore, William Fichtner, Eric Bana, Orlando Bloom, Sam Shepard, Jeremy Piven, Tom Hardy and Ewen Bremner. Jarhead – Based on the Gulf War memoirs of Marine Anthony Swofford, this Sam Mendes film tells of Swofford’s (Jake Gyllenhaal) time during Operation Desert Shield as a sniper. Battling boredom and friendly fire, he and his spotter desperately try to get a kill before the fighting is over. An interesting look at the psychological toll which war takes on soldiers. 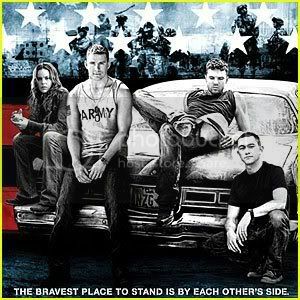 Stop-Loss – Staff Sergeant Brandon King (Ryan Phillippe) returns home from the Iraq War and expects to be discharged, but he’s assigned to return to Iraq as part of the military’s stop-loss policy (in which enlisted men can be kept past the term of their enlistment). He promptly goes AWOL and tries to work out the horrors of war which he experienced. Also starring Channing Tatum, Abbie Cornish, Timothy Olyphant and Joseph Gordon-Levitt. Pretty Village, Pretty Flame – Considered a classic of modern Serbian cinema, the film tells the story of how the Bosnian War came to be and what life was like in the former Yugoslavia. This was the first Serbian film to show the Serb side involved in ethnic cleansing and war atrocities. Savior – Produced by Oliver Stone and starring Dennis Quaid, Savior tells the story of an American mercenary serving during the Bosnian War. After watching friends die over the years, he’s become hardened to the horrors of war, but a pregnant young woman shocks him back to his senses. As atrocities occur all around them, the mercenary tries to get the woman and her newborn child to a United Nations safe zone. Hardly an uplifting film, but when has war ever been uplifting? 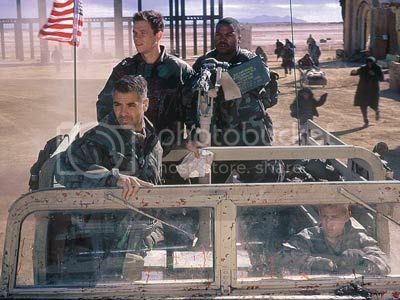 Three Kings – A group of American soldiers (George Clooney, Ice Cube, Mark Wahlberg and Spike Jonze) attempt to steal Kuwaiti gold bullion from the bunkers of Saddam Hussein. Part comedy, drama, and war movie, the soldiers must eventually end up helping a group of Shia rebels who were encouraged to rebel against Hussein by the U.S. only to later be abandoned and face execution. Behind Enemy Lines – Chris Burnett (Owen Wilson) is a hotshot pilot shot down over Serb-held territory during the Bosnian War. Gene Hackman is his gruff commanding officer who doesn’t believe in leaving any of his men behind. As Burnett tries to outrun the pursuing Serb soldiers (and an especially tenacious sniper), he encounters many of the horrible events brought about by the fighting. This one is hardly high art, but it’s a good way to get the casual viewer interested in the events of the Bosnian War. Afterwards, try to get them to watch a movie like No Man’s Land or Pretty Village, Pretty Flame. Hotel Rwanda – Considered by many to be the “African Schindler’s List,” Hotel Rwanda follows hotelier Paul Rusesabagina (Don Cheadle) as he tries to save his family and thousands of refugees from military forces bent on ethnic cleansing. Nick Nolte has perhaps the most powerful scene in the film, as he plays a U.N. peacekeeper shamefully explaining to Paul why his forces can’t take direct action. Salvador – Oliver Stone directs James Woods in this story of a journalist desperate for a big story. He makes his way down to El Salvador and covers the Salvadoran Civil War, dodging death squads and unfriendly military leaders at every turn. James Belushi gives a fine performance as his burned-out pal who goes native. No Man’s Land – A dark Bosnian comedy/drama about two soldiers from opposite sides who find themselves trapped together in a trench in no man’s land. Another soldier, meanwhile, wakes to discover that enemy troops have buried a land mine beneath his body. Received the 2001 Oscar for Best Foreign Language Film. Crimson Tide – Denzel Washington and Gene Hackman star in this submarine drama which takes place in 1995. During a period of unrest in Russia, the Captain of a nuclear submarine (Hackman) receives a partial message which he believes is an order to fire their warheads. His second-in-command (Washington) is not so sure, however, and suggests that they hold off to receive confirmation. Thus begins a battle of wills between the two men and the rest of the crew. Look for Viggo Mortensen and James Gandolfini before they were stars. In the Valley of Elah – Based on actual events, In the Valley of Elah follows a father (Tommy Lee Jones) as he searches for the truth about what happened to his son, an Iraq War veteran who was murdered stateside. Also starring Susan Sarandon and Charlize Theron. The Beast – During the Soviet invasion of Afghanistan, a Russian tank becomes separated from its unit and stranded in a dead end valley. George Dzundza plays the ruthless tank commander, and Jason Patric is the more sympathetic tank driver. As the tank heads though the valley, they are pursued by an Afghan leader (Steven Bauer) seeking revenge for the death of his kinsman. Shake Hands with the Devil – This Canadian film is based on the book by Romeo Dallaire entitled Shake Hands with the Devil: The Failure of Humanity in Rwanda. The film follows Dallaire’s life through the time of the 1994 Rwandan Genocide and shows how his pleas of aid to the United Nations were ultimately ignored. So that’s my list of the best modern war movies. If you enjoyed it, I might also suggest a couple of our previous articles: 25 Military Movies to See Before You Die and 75 War Movies to See Before You Die. Some of the films listed above are repeated on these lists, but you’ll also find a ton of movies dealing with the Vietnam War, World War II, World War I, and any other military conflict that you might imagine. This entry was posted on Saturday, September 5th, 2009 at 9:41 am and is filed under Good Movies, Movie Megalists. You can follow any responses to this entry through the RSS 2.0 feed. You can leave a response, or trackback from your own site. 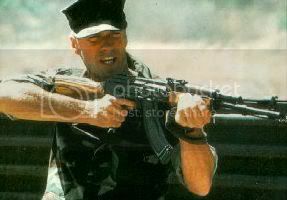 uhh i realy enjoyed black hawk down that was very modern anything rea;;y modern to that movie? I didn’t know that. Thanks for the info, Petur. No argument here. I wrote this list before I’d actually seen The Hurt Locker. nice list, saving private ryan shud also be included…. By “modern war movie” I was referring to war films made in the modern era. Black Hawk Down is a very good war movie. I also really enjoyed Blood Diamond, in my opinion, one of the best movies ever made. I recomend that one. I was also wondering about these movies: Atonement, Miracle At St Anna, The Kingdom, Universal Soldier, Valkyrie, and Saving Private Ryan. If you have seen any of these movies, please tell me wich ones are good or bad, or if there are any other good war movies that you think are worth seeing, please say so. I agree with you on Blood Diamond. It was a very nice surprise. As for the others you’re asking about, I’d recommend Saving Private Ryan if you want in-your-face war action, Atonement if you’re looking for a chick flick, and Valkyrie if you want more of a historical drama. None of the others are bad, either, and Universal Soldier does feature the one-two punch of Jean-Claude Van Damme and Dolph Lundgren. black hawk down was good, behind enemy lines was alright.. not great, and im about to see jarhead. Valkyrie like shane said… its like historical not very good. Yes “The Hurt Locker” is a very good movie. Trust me, you’re always thinking what will happen next. Never boring. green zone is very current but also good, definitely not to be missed! How could you leave off “Tears of the Sun”? One of the few movies that depicts Special Forces, and very telling of the modern world. “The Kingdom” is really good, but quite controversial. should definitely be on the list. “Body of Lies” is also really good but not sure whether the qualifies. Like your list. Blach Hawk Down is my all time favourite. Welcome to Sarajevo might have been included (did a review on my site). Battle for Haditha is quite good as well. I did not like Jarhead. But one of the very best – yes, yes it is a HBO series- is Generation Kill. Once you get into it. Three Kings is very special. Hmm.. I Think Green Zone should be added in the list.. It’s such a great film in my opinion.. haha..
anyway, does anybody has an ‘Iraqi War/ Middle east modern War Movie’?? or maybe a truestory films about WAR? But, if u’ve seen these films, could you please recommend whether it’s good or not..
stars chow yun fat or somebody like that and is a chinese film in english portraying the little-known experiences of Hong kong soldiers in vietnam. I remember thinking how unsubtle the title was and expected little better from the film. I was genuinely disturbed and it took an hour or two’s struggle to get the brutal nastiness out of my head. I would certainly recommend Band of Brothers and The Longest Day. Band of Brothers has the same look as Saving Private Ryan (Steven Spielberg was an executive producer), and The Longest Day has a cast ranging from John Wayne to Henry Fonda. plz add john rambo 2008 .. Very helpful blog” I really liked inglorious bastards with brad pitt but it somewhat of a comedy. nice blog…..but anyone can suggest me action-war movie like black hawk down…. bdw i dont see saving private ryan here..
No, because “modern war movies” refers to wars fought in recent years. Since WWII took place over 60 years ago, it wasn’t considered a “modern war” for the purposes of this list. havent heard of Tears of the Sun?? Yes, I’ve heard of it, but I didn’t feel it deserved a place on the list. I’m glad you liked it, though, and I would certainly suggest that any Bruce Willis fan check it out. Does anyone remember the title to this movie? It was about a damaged AMERICAN P-40 Warhawk evading this German Panzer tank throughout the desert. If its a “military” movie that we are talking about but I’d give battle los Angeles and battleship a shot. Battleship storyline…honestly is pretty bad but to see some navy action…loved it, especially near the end. Battle Los Angeles is pretty good as well in my opinion and portrayed the military pov pretty decent for a Sci fi movie. There is also red dawn coming up where its less military but the main character is a us marine and fights north korean invasion, it’s a remake of previous red dawn with Russia invading America so it’d be pretty cool seeing a modern day, high budget Hollywood blockbuster version of it. Machine gun preacher, true story of KONY and not military but more towards biography of Sam Childers made in Hollywood perspective. Snipers was also a decent film as well, couldn’t vouch for the sequels. Not very modern but “taegukg”i a Korean war movie about two brothers in Korean war or WWII? It’s been a while so memory is a bit foggy. Restrepo a documentary movie, I thought was good. Act of valor should be up on the list of these movies pure purpose being that all the actors weren’t really actors but actual seals(how awesome is that?!) but just like anybody else keeps repeating…there has been no movie like black hawk down, saw it as a kid, watched it over 10 times and it still doesn’t get old.